The cast of Second City's A Red Line Runs Through It includes veteran comedians Scott Morehead and Lisa Beasley. I came into Second City’s e.t.c. Theater with reservations. Where’s the goddamn entrance? Obviously, I figured it out. But I still worried that the show would be pigeonholed, either by the meme-baiting mainstream humor of murderous presidential candidates or overly partisan political drivel. While not unfounded, my doubts quickly disappeared: A Red Line Runs Through It, Second City e.t.c.’s 40th Revue, was a smashing success. 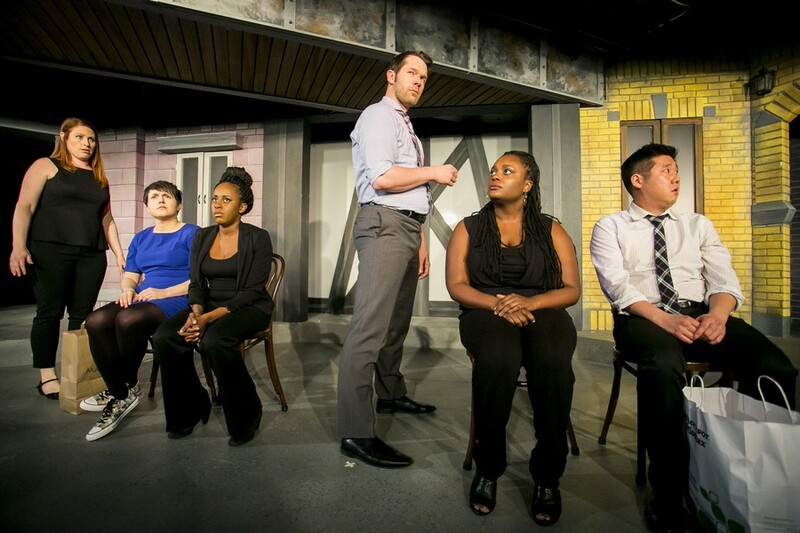 Second City is king, queen, and prime minister when it comes to live sketch comedy, and A Red Line Runs Through It reminds us why. No other theater could get away with stealing a Divvy bike for a single joke. The set was well crafted and the overhead lights of subway trains made for an intriguing idea, but props like the bike took the revue above and beyond. Moreover, performers brought in a poster or sign for each sketch and left them scattered across the stage, stockpiling lessons learned along the way. What truly convinced me of Second City’s excellence was the cast. Standouts Scott Morehead and Lisa Beasley channeled their experiences from past revues: the differences in expertise between cast members were quickly apparent. Morehead showed a gift for physical comedy and splendid range, effortlessly switching from goofy news reporter to psychologically traumatized quiz-bowl star. Beasley’s performance was unparalleled on stage, delivering a strikingly sincere song about the struggles of being a new mother. New cast members were no slouches, either. Despite some rough edges, Peter Kim and Julie Marchiano in particular showed a unique talent that foreshadows continued success on stage. Oh, Second City and its politics. I like to keep my political and character-driven humor separate, like different food groups on a plate. But the cast executed political comedy better than I expected, leaving me too busy laughing to nitpick ideologies. Jokes and insults hit both parties with equal vitriol, from blustery Bernie impressions to “The Make America American Again America political action committee” Super PAC. Some parts lost themselves to preaching and partisanship, namely when performers literally placed Elizabeth Warren on a pedestal. These were exceptions, however, in a show dedicated to unmasking the corruption and flaws of both parties. My other fear was of obvious humor, by which I mean the easy opinions that every schmuck with a Facebook account recites on the daily. Surprise is essential to comedy. There is nothing surprising about Zodiac Killer jokes or Hamilton references. When the cast broke into rap about the current political candidates, I feared the worst. “Oh, God,” I thought. “It’s a cop-out. They’ve copied the Facebook meme pages.” Sure enough, the sketch was well done and entertaining but not really funny. There’s no enjoying a joke if you already know the punch line. A Red Line Runs Through It runs through November 20. 1616 North Wells Street. $28–48. Check Second City’s website for showtimes and ticket information.